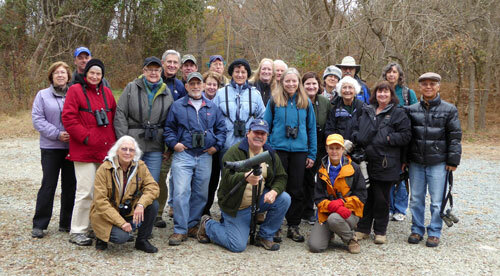 New Hope Audubon Society throughout the year hosts bird walks. These are held on Wednesdays, Saturdays, or Sundays and are listed in our website and on social media. Depending on the time of year, we meet at 7:00 or 7:30, usually in the parking lot in front of the Wild Bird Center in Eastgate Shopping Center in Chapel Hill, though for some walks we meet at alternative sites. Visit our calendar for details. Our walks are designed to accommodate individuals or families or small groups, and anyone from beginning birders to more advanced birders. Our bird walk leaders are experienced, knowing when and where to find the birds. And they are very good at teaching how to see them and how to learn about them. Moreover, many people find our bird walks are not only a fun and exciting time but are a wonderful social event, bringing together a diverse group with a common interest. We usually go to a local site and spend two or three hours before returning. We encourage people to bring a snack and water and to dress appropriately in long pants and sturdy shoes. The walks are weather dependent and we post on social media if possible where we are going and any constraints. The one certainty, the more often you get out to see nature, the more likely you will witness an incredible and unique sight. Come join us.